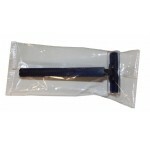 Precision-ground cutting edges provide clean, even cuts and they are made of quality steel for long-..
Oral-B Soft Toothbrush $0.45 Each. Oral-B Soft Toothbrush for kids.Case of 96..
Freshmint Pediatric toothbrushWhitePolypropylene plastic6" inchesIndividually wrappedCase of 1440.. These wholesale hygiene pocket tissues are great size for traveling or to carry in your pocket for t..
Enriched with moisturizing plant and fruit extracts, this wonderful conditioner is the perfect way t..
Royal Pocket Tissues $1.20 Each. 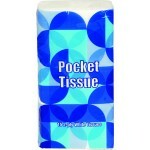 Royal Pocket Tissues8 pack 10 ct.Traveling tissues 3 ply24 - 8 packsCase of 24.. 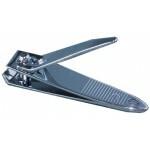 Single Blade Razors. 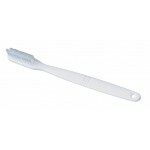 These razors are part of the wholesale hygiene product list for the everyday us..
Freshmint toothbrushWhite w/ rubber gripPolypropylene plasticIndividually wrappedCase of 1440..
Travel Hygiene Kit $3.75 Each. 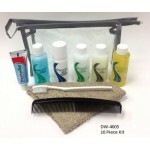 Wholesale Hygiene Kit- 10 ItemsIncludes:1- .85 oz. 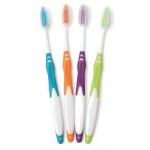 Toothpaste1- 2 oz. Mouthwash1- 1.5 oz. Roll-.. 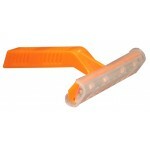 Triple Blade Razors $0.28 Each. 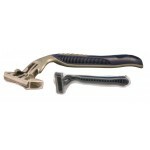 Triple Blade Razor with Lubricant for a smooth shave.Case of 50..
Twin Blade Razors $0.18 Each. Double Blade RazorBlue bodyDouble bladeIncludes safety coverCase of 500..
Wholesale Hygiene Kit -- 18 Items 1 – Resealable ..
Young Adult Kit $6.00 Each.